MBC takes participants through the entire cycle of new venture creation from creating a strong pitch to conducting a marketing and financial assessment and writing a comprehensive business plan. The competition kicks off in November with more than 100 teams competing in the qualifying round and concludes in March with four competing teams at the finals. In addition to the traditional track, MBC boasts the Seigle Impact Track. During each round, teams will pitch to a new panel of judges comprised of entrepreneurs and investors. Teams that advance to Round 2 will also be eligible for consideration to participate in intercollegiate business plan competitions and receive coaching and financial support from the Zell Lurie Institute to prep for and cover competition travel expenses. In addition to hosting the competition, the Zell Lurie Institute facilitates startup workshops to help prepare student teams for the deliverables due for each round of the competition. Workshop presentations and handouts are posted on the Zell Lurie Institute Canvas site under Startup Workshops. Qualifying Round (November 15-16) kicks off the competition where more than 100 teams from across campus are expected to compete. Any student that submits a complete application will be invited to compete in the Qualifying Round. Teams will give a three-minute pitch (no slides) to a panel of judges followed by three minutes to answer questions. Approximately 60 teams will be chosen to advance to Round 1. Round 1 (November 30) Approximately 60 teams will give a three-minute pitch (no slides) to a new panel of judges followed by four minutes to answer questions. Sixteen to twenty teams will be chosen to advance to Round 2. Each team that participates in Round 2 will receive $250 after participating in Round 2. Round 2 (February 8), about 16-22 teams will advance from Round 1 to compete in this round. Competing teams give a seven-minute presentation that describes their company's solution to a pressing market need or pain, an estimation of the market size, and their financial assumptions. This is followed by ten minutes of questions from the judges. Eight-ten teams will be chosen to advance to the semi-finals and will each receive $500 after participating in the semi-finals. Four teams will be chosen to compete in the Seigle Impact Finals. Semi-Finals and Finals (March 15) teams will complete a business plan. Semi-finalists present their business plans for 15 minutes and will have 15 minutes to respond to questions from the judges. Four teams will be chosen by the judges to advance to the afternoon Finals. Finalists will discuss their businesses with the judges during a 25-minute interactive session. Team Showcase (March 15) All Semi-finalist teams will display information about their ventures and talk with guests from the region. 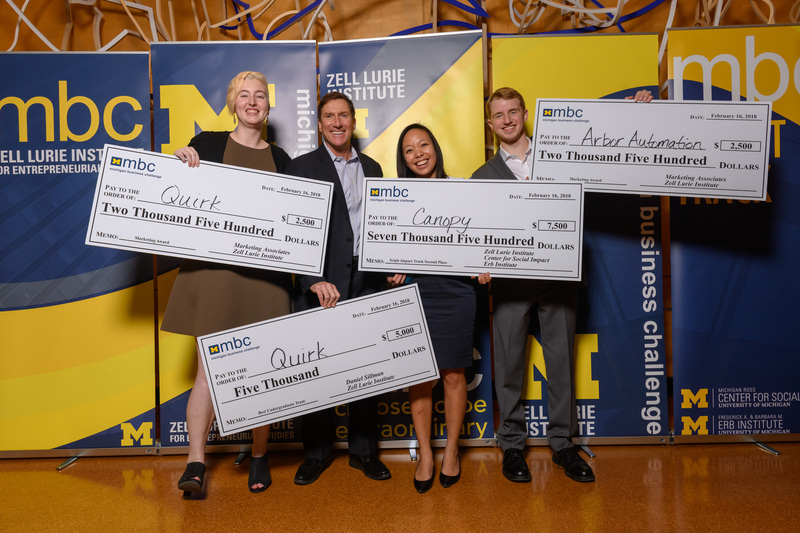 The Michigan Business Challenge Seigle Impact Track, with prizes totaling over $26,000, recognizes the business plan that best pursues a mission-driven goal. This award aims to stimulate the creation of new businesses, products or services that prioritize social and/or environmental considerations. Eligible teams will be selected during the first round of MBC to compete in the Seigle Impact Track starting during the second round. This track of the competition is sponsored by the Mark and Robin Seigle Entrepreneurial Innovation Fund and co-managed by Business + Impact at Ross, the Erb Institute for Global Sustainable Enterprise, and the Zell Lurie Institute for Entrepreneurial Studies. The Michigan Business Challenge is open to all current U-M Ann Arbor undergraduate and graduate students. Teams may add or remove members throughout the competition. At least one member of the student team must be the author of the business plan. The proposed business may be for a consumer or industrial product or service. The business may be for-profit or non-profit, though most competitive businesses demonstrate high growth and/or large market potential. Buy-outs/turn-arounds, expansions of existing companies, real estate syndications, tax shelters, franchises, licensing agreements for distribution in a different geographical area, and spin-outs from existing companies. Ventures with significant revenue prior to the current academic year. Ventures that have raised equity capital from sources other than the members of the student team before the current academic year. A business venture that reaches the Finals may not compete in future Michigan Business Challenges. Clot Buster, Pryor-Hale award for best business for $25,000, and one of two Outstanding Presentation awards for $2,000. Luis Savastano, M.D., Yihao Zheng (PhD ‘16), Jeffrey Plott (PhD ‘17), and Joshua Cockrum (BS ‘16). MedKairos Inc., Pryor-Hale Runner-Up Award for $10,000 as well as one of the two Outstanding Presentation awards for $2,000. Michael Moore (MD ’21) and Andy Kozminski (MSE ’19, MD ’20). Advanced LIDAR Semantics (ALISE), $2,500 finalist award. Sanmeet Jasuja (MBA/MSI ’18), Brian Shahbazian (MS ’18), Ryan Branch (BSE ’18) and Minjeong Cha (PhD). PedalCell, $15,000 Seigle Impact Track first place and a $2,000 Outstanding Presentation Award. Adam Hokin (BBA ’19) and Anna Moreira Bianchi (MBA ’19). Canopy, $7,500 Seigle Impact Track runner-up award and the second place Elevator Pitch Award for $250, Ann Duong (MHI ’18) and Brandon Keelean (MDes ’18). FoodFinder, $2,500 Seigle Impact Track finalist award and a first place Elevator Pitch Award for another $500. Jack Griffin (BBA ’19). This grand prize is awarded to the team that the judges feel is most likely to succeed, most likely to have the largest success, and has the most viable business. A runner-up business team will also be identified and will receive $10,000. Judges decide these awards by using a variety of factors. They consider the market opportunity that is presented and whether the team has a clear path to take advantage of that market, along with the competitive advantage for that business. The judges also evaluate the teams' management capability to see if the team has the skill to advance the company and handle the risks of the venture. Finally, the judges analyze the financial strategy of the business to determine if this would be a worthwhile venture for a firm to invest in. This track is presented by the Zell Lurie Institute in partnership with the Frederick A. and Barbara M. Erb Institute and the Center for Social Impact. The goal of this award is to stimulate the creation of new businesses, products or services that prioritize social and/or environmental considerations. The award recognizes the business plan that best pursues a mission-driven goal through its product/service offerings and underlying operations of the firm; the firm may be either for- or not-for-profit. Teams must enter the multistage Michigan Business Challenge in the fall and also submit a one-page Statement of Impact. This award is for the most successful team with at least one currently enrolled Ross School of Business student and one currently enrolled College of Engineering student. To be considered for this award, teams need to write a one-page Management Team Overview that details the roles and skills of the team members and submit it when the Market and Financial Overview is due in January. Teams apply for the award in Round Two and the most successful cross-functional team within the competition will receive the award. There are no additional presentation or documentation requirements for this award. The Marketing Award, sponsored by Marketing Associates, will be awarded to up to two teams that compete in Round 2 of the Michigan Business Challenge. The award will recognize the teams that most effectively identify their markets, understand the market needs, and present how the company will address those needs and deliver a product or service offering. Awardees will convince judges that they can reach their market and deliver value to the customers in an effective manner. A full marketing strategy is not required, but a full understanding of the dynamics of the market is. This award, sponsored by Daniel Sillman, is for the most successful team made up exclusively of undergraduate students. To be considered for this award, teams need to indicate they are eligible for this award in an email message when the Market and Financial Overview is submitted in January. There are no additional presentation or documentation requirements for this award. The Small Giants Positive Organizing Award will honor the team that most effectively designs a plan that introduces core values that bring their initiative’s purpose to life, creates a positive culture that brings out the best in their team, and demonstrates a commitment to fostering positive relationships within their organization and in their community. Awardees will articulate their positive practices in a One-page Statement of Intent that is to be included in their Round 2 Feasibility Study deliverables. One team eligible for the Small Giants Positive Organizing Award may be sponsored to compete in a related intercollegiate competition during winter 2019. The $2,500 prize will be awarded to one team that competes in Round 2 of the Michigan Business Challenge. The award is sponsored by the Small Giants Community and the Center for Positive Organizations. A well-written business plan often serves as a persuasive case for potential business partners and funders to support the business. In recognition of this important function, this award focuses on the research and presentation of the business plan document and de-emphasizes the viability of the business. The Institute will evaluate the business plans submitted for the Semi-finals and choose the winner of this award. The evaluation of the submitted business plans is based on the presentation and communication of the relevant aspects of the business, including: product description, competitive strategy, financial selection, management, discussion of the risks and the contingency plan, etc. These awards recognize that the skills needed to sway a skeptical audience of potential business partners are invaluable when an entrepreneur moves the business forward. One team from each semi-final track will receive this award. Judges will evaluate the presentations based on the presenters' style and the content of the presentation. Specifically, the judges will be looking to see if the team can maintain the judges' interest while relating the need for the company. The team's ability to respond enthusiastically to difficult questions is also considered. While critiquing these facets of the presentation, the judges should be able to understand what market is being addressed, the problem being solved, what the fund raising strategy is, what the valuation is, the teams upcoming milestones, etc. Students from the Michigan Investment Challenge committee (MIC) will award a cash prize to an MBC semi-finalist competitor. Teams that compete in the finals, but do not receive a larger award, receive $2,500 in addition to the $750 mentioned above. SAHI Cosmetics, Pryor-Hale award for best business for $25,000, and one of two Outstanding Presentation awards for $2,000. Sheleen Sahi (MBA ’17). PreDxion Bio, Pryor-Hale award for best business for $25,000, and the Williamson Award for $5,000 for the most outstanding business and engineering team. Represented by Caroline Landau (MBA '16) and Walker McHugh (MSE '17). Gaudium, Pryor-Hale Runner-up award for Best Business for $10,000, the Best Written Plan award for $2,000, and one of two Marketing Awards, sponsored by the Marketing Associates, for $2,500. The Gaudium team, is comprised of David Cai (BS '16), Amanda Li (MAcc '16), and Kevin Jeon (BA '16). Kulisha, Social Impact Track Grand Prize. Represented by CoFounder Eric Katz (BBA '17). StepFor, Social Impact Track Runner Up. Team members include Jordan Golshan (BBA ’17), Andy Jinseok Lee (MS ’17), and Josh Hyorim Kim (BS ’17). AOE Medical, Most Successful Undergraduate team award for $2,500 and one of two Outstanding Presentation awards for $2,000. Represented by Arianna Carley (BSE '17), Eli Fox, (BA '17), Christina Tang (BS '18), and Brandon Boot (BSE '17). Sage & Grace, Outstanding Presentation award for $2,000. Founder Holly Price (MBA '17). CARt, Marketing Award, sponsored by Marketing Associates, for $2,500. Represented by Ali Jensen (MPH '16), Stacey Matlen (MPH '16), Christine Priori (MBA/MPH '17), Mikaela Rodkin (MBA/MS '17). Monday, November 5 by 8:00 a.m. Eligible teams who submit an eligible application through by completing the intent to compete form will be invited to compete in the Qualifying Round. The application must be emailed to ApplyMBC2019@umich.edu. Tuesday, October 30, 5:00-6:00 p.m.